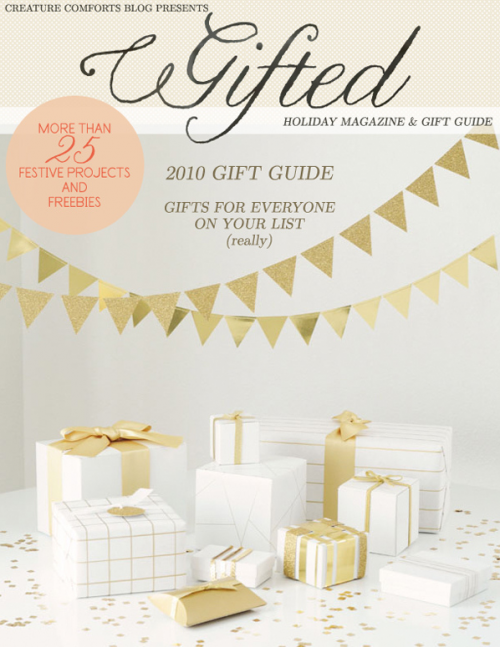 I am just giddy about this inspiring new Holiday magazine & gift guide recently launched by Creature Comfort (blog). Gifted is a stunning on-line publication bringing together an assortment of talented minds offering you gorgeous ideas and products. The magazine features include shopping, gift ideas, decor, treats, do-it-yourself projects and so very much more. After I stumbled across this magazine one afternoon via a Facebook status, I simply could not stop admiring the beautiful images that are so precisely laid out. Once I could bring myself to stop swooning over the whimsical appearance, I began to explore the written portion and blogger links the publication had to offer. The magazine itself is such a joyful experience, but the adventure lying on each of it’s pages appears to be endless. Inside you will discover a whirlwind of inspiration on each and every one of the 200 plus pages. Without elaboration, there is simply something for everyone. Each and every one of the contributor’s deserves a pat on the back for a job well done, along with the dreamer behind the idea for such a stunning piece of on-line publication. One more bit of good news that I must mention is that access to Gifted magazine is totally FREE. Not only is it free, it gives amazing gift ideas and provides links to each one, giving the magazine both beauty and brains. Well this would a lot more helpful a few days ago when I was shopping for the wife. Just kidding. This is a great little online magazine and I need to bookmark it because maybe it will help me with her birthday present in March. Take care.